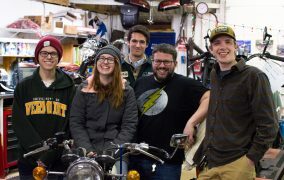 Essentially, there are two ways to go in solving the “kick start” problem for owners who have difficulty starting their bikes or are concerned about kickback injuries – either eliminate it with a fully automatic starter (like a conventional automotive starter) or reduce the effort required with some form of assist. Our customers made it very clear they would prefer to keep the kick start function if it could be made easier and less dangerous due to kickbacks. 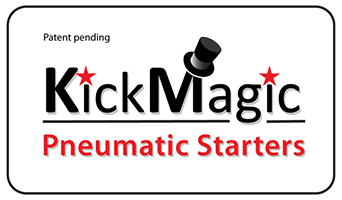 KickMagic marries a linear pneumatic actuator with a commercially available high pressure paintball air tank to provide up to 160 onboard start assists while on the road or the option of simply plugging it in to shop air in your garage for unlimited starts. One byproduct of the design is the elimination of kickback due to backfires as the pneumatic actuator acts as a strong, but resilient, buffer. KickMagic is easy to install with no modifications to your motorcycle and the major components can be removed from your bike in a few minutes for storage with common tools. The heart of the system is the coupling of the pneumatic actuator to a multi-function “combination” shaft mounted on the bike’s existing kick start gearbox interface. The patented system optimizes the mechanical advantage necessary to reduce the input impulse (our fancy engineering word for the hefty kick from your leg) by 70+ %. The force balance achieved by sizing the actuator cylinder, input pressure and radius of the combination shaft is unique for each motor and gearbox on a given type of motorcycle (displacement, compression ratio, gearing and so on). 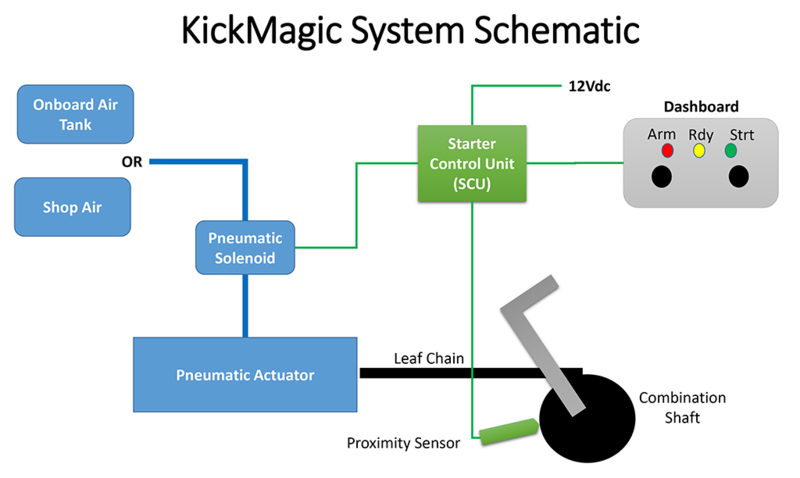 Ergo, KickMagic systems will share some, but not all, components when applied to different makes and models of machines. 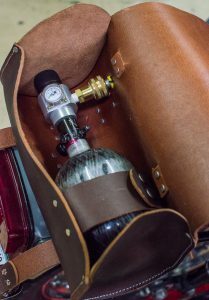 Onboard air is supplied via DOT approved carbon fiber paintball tanks. These tanks are rated at 4,500 psi and come in three sizes: 50 cu-in, 68 and 90 cu in. The 50 cu in tank will hold approximately 90 start attempts while the 68 and 90 cu in bottle holds 120 and 160 start attempts respectfully. Tanks are filled at paintball shops, dive shops, industrial air suppliers, etc. (see Air Supply Options for more info). The required input air pressure to the pneumatic actuator is typically 80 to 100 psi, and is adjusted once at the tank regulator when the system is installed to give the desired level of assist. For example, higher compression engines would require higher input pressure. A worn in, lower compression engine would require less. Shop air from your garage compressor is adjusted with the regulator on the compressor. Operator control of the system is done via the dashboard controls mounted on the handlebars, while the system logic is embedded in the starter control unit (SCU) mounted under the battery box. The SCU can be wired POS or NEG ground and the entire KickMagic system draws less than 1.5 amps at 12Vdc. A position sensor, mounted in proximity to the combination shaft, provides a safety interlock signal indicating that the kick start lever is in the ready position. A typical vertical twin British motorcycle, like the Triumph 650’s and 750’s, utilize 360 degree crankshafts, meaning the firing cylinder is 360 degrees out of phase with the exhausting cylinder. A normal, healthy kick start rotates the crankshaft 720 degrees (two rotations). To the operator, this means that there are two torque spikes – the first one is at the top of the compression stroke where the kick begins, and the second is when the second cylinder comes up on compression. Once the engine is in motion, some of your initial leg energy is stored in the moving mechanical bits (mostly the crankshaft/flywheel) which helps smooth out the second torque spike. 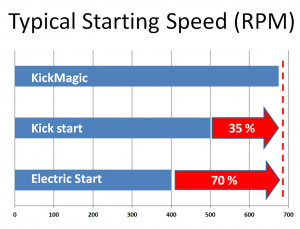 As an added benefit, with KickMagic the average rotational speed during the kick, all things being equal, is 35% faster than an unassisted kick , which results in higher RPM and more reliable starting. It is notable that a sample of period motorcycle electric starters spin a motor around 300 to 400 RPM *, while a kick start, when smooth and firm, generates speeds on the order of 500 RPM for a typical 650/750 Triumph. 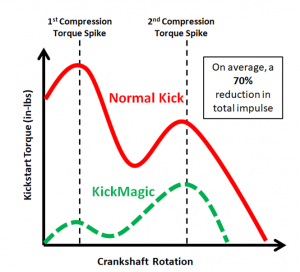 KickMagic boosts that to over 650 RPM. An electric starter, of course, allows for more continuous starting RPM, but it is the speed that is the key to reliable and consistent starts. Put another way, an electric starter that turns the motor at 100 RPM would likely never start the bike.